From an overhead angle, a blue bowl of cereal and a sandwich on a plate, sitting on a yellow tablecloth, are shown in opposite corners of the frame. A broken muffin lies between them in the center. 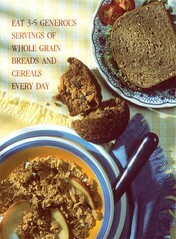 The red lettering in the upper left reads: "Eat 3-5 generous servings of whole grain breads and cereals every day". Shot on 4x5 format. This was used in the 1989 calendar "Eat for Good Health" May 1989.